Playing Fortnite with friends can be a little frustrating if you’re the kind of player who tends to get eliminated quickly. But in the next big update to the game, you will no longer have to sit out the rest of the match, twiddling your thumbs. With the arrival of the Reboot Van, teammates will be able to bring fallen friends back to the game. When one of your teammates gets eliminated in duo or squad matches, they’ll drop a Reboot Card along with all their loot. To resurrect them, all you need to do is collect the card and take it to a Reboot Van. Any surviving teammate can resurrect a fallen player, but the reboot process takes a little time. What’s more, the van makes a noise and projects a beacon into the sky that lets nearby enemies know a reboot is in progress. Once a Reboot Van has been used, it will be unavailable for some time. Vans will be located near major points of interest, Epic says, so that means popular areas like Tilted Towers, Retail Row, etc. But remember: Without their Reboot Card, you can’t bring teammates back. 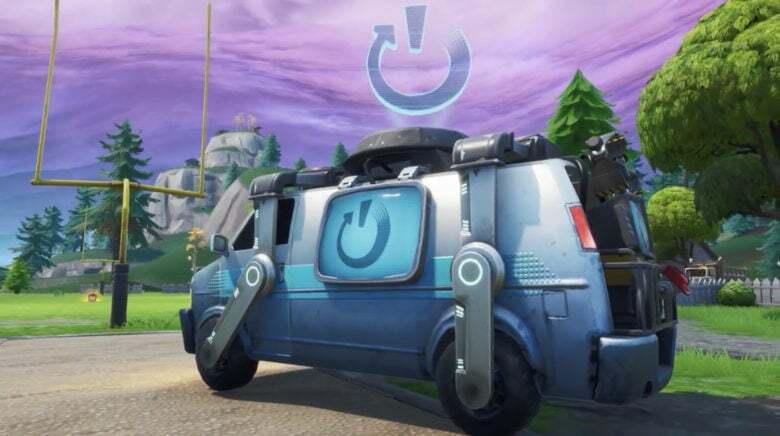 Some Fortnite players will feel the concept of the Reboot Van is very familiar. That’s because almost exactly the same mechanic is used to bring back eliminated friends in Apex Legends. Epic will almost certainly get some criticism for ripping another feature from a rival game. Especially a game so popular that it is really the only threat Fortnite has right now. But players will welcome the ability to bring back friends who checked out early. The Fortnite version 8.30 should roll out this week — likely on Tuesday or Wednesday. You’ll find other big changes to the game right here on Cult of Mac when the patch notes are confirmed.